Prepare the mussels by scrubbing them clean with a scouring pad. If they have beards, remove them with the use of a sharp knife. Be sure to discard any mussels that do not close when being handled or run under cold water. 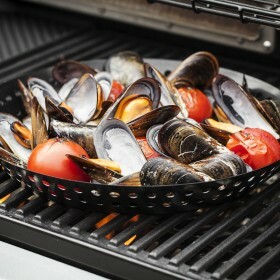 Fill the grilling wok as full as you can with mussels on top of a bed of cherry tomatoes. You may do this in a few batches if you prefer. Cover the top of the grilling wok with aluminium foil and place the grilling wok on the grill. If need be, fold the handle of the grilling wok upwards to be able to close the hood. If your BBQ does not have a hood, place the grill as close to the flame as possible. 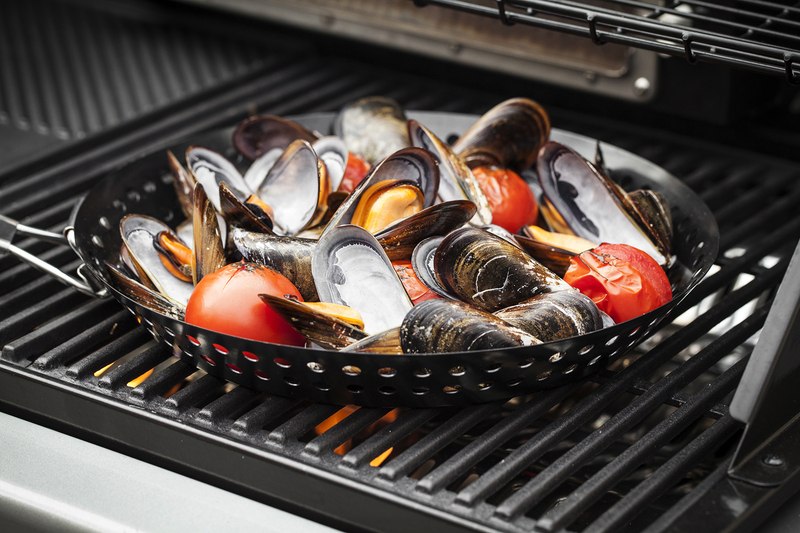 Remove the mussels from the grilling pan and reserve on one side under a damp tea towel. Gently squeeze the tomatoes into a saucepan and discard the skins. Gently fry with extra virgin olive oil and the white pepper until much of the water has evaporated. Add in the white wine and allow to reduce by half. Once reduced, add in the 1.5 cups cream. Heat through but do not allow to boil. With a hand mixer, puree the mix and then sieve to remove any large seed pieces. Separate the empty shell side of each mussel and discard. Loosen the meat from the shell and serve with the warm roasted tomato cream sauce topped with finely chopped parsley and freshly cracked black pepper.